Is your home safe? CSST could put your family at risk. Corrugated Stainless Steel Tubing (CSST) is a flexible, stainless steel pipe used to supply natural gas and propane in residential, commercial and industrial structures. 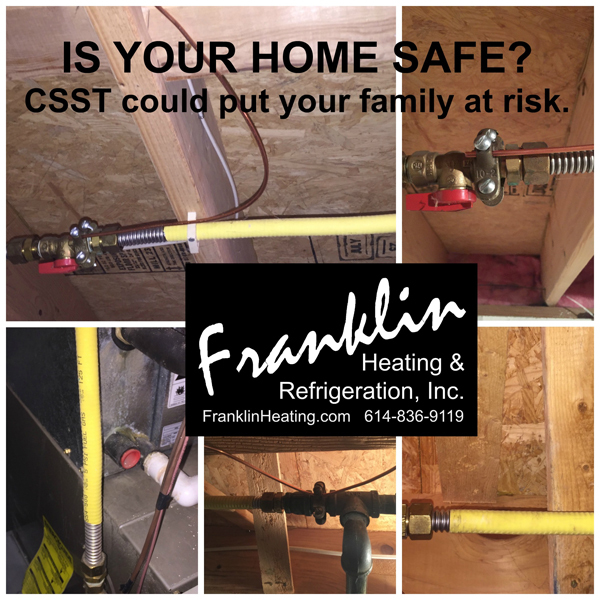 CSST is usually routed beneath, through and alongside floor joists in your basement, inside interior wall cavities and on top of ceiling joists in attic spaces or connected to fixed appliances such as water heaters. CSST is often coated with a yellow, or in some cases, a black exterior plastic coating. In addition to the flexible installation benefits, A CSST gas piping system has fewer joints, and therefore less potential leak paths. However, one of the risks of CSST gas piping is the possibility of a lightning strike causing a pin-sized hole in the line leading to a house fire. Although not included in the current electrical code, manufacturers now require bonding the CSST to a grounding source to reduce this risk. Unfortunately, for several years CSST was installed without the bonding requirement. Homes with CSST installed before the bonding requirement still meet current code, but many professional recommend the system is bonded to today's standards. Checking to see if your home has CCST is fairly simple: follow your gas supply line as it enters your home and continues to your gas appliances. (CSST should NOT be confused with flexible gas appliance connectors - the product that joins a moveable appliance to your home or building's gas supply line.) Look for the flexible line that resembles a garden hose. If you find CSST lines in your home, don’t worry. Our service technicians would be happy to retrofit your CCST to reflect the new recommendations during your next service call or tune-up. Of course, proper bonding won't make CSST immune to damage from a nearby lightning strike, but it will reduce the risk of damage. For some homeowners, even the reduced risk isn’t something that they are willing consider. If you would like to eliminate CSST from your home, we can send an estimator, free of charge, to quote replacing it with rigid black pipe. Franklin Heating and Refrigeration is celebrating over 22 years in business and an A+ rating with the BBB! In addition to counting on us for your heating, air conditioning and commercial refrigeration needs, we service and install whole-house humidifiers and air purifiers, hot water heaters (including tankless instantaneous units), pool dehumidifiers, restaurant equipment, and permanently-installed, automatic, whole-house generators. Our expert technicians proudly serve the Greater Columbus area as well as Delaware, Fairfield, Franklin, Hocking, Licking, Madison, Pickaway, and Union counties.